These books by Jim Larsen are the best selling books on the topic of Stirling engines at Amazon.com. See the list here! Follow Jim on his Video Blog as he discusses self publishing and technical writing. Here is everything you need to know to build your own low temperature differential (LTD) Stirling engines without a machine shop. These efficient hot air engines will run while sitting on a cup of hot water, and can be fine-tuned to run from the heat of a warm hand. Four engine projects are included. Each project includes a parts list, detailed drawings, and illustrated step-by-step assembly instructions. The parts and materials needed for these projects are easily obtained from local hardware stores and model shops, or ordered online. Jim Larsen’s innovative approach to Stirling engine design helps you achieve success while keeping costs low. All of the engines described in this book are based on a conventional pancake style LTD Stirling engine format. These projects introduce the use of Teflon tubing as an alternative to expensive ball bearings. An entire chapter is devoted to the research and testing of various materials for hand crafted bearings. Video: Watch Jim R. Larsen introduce this new book on YouTube. Quick and Easy Stirling Engine! "Thanks Jim for putting out this great book! I'm having my physics students get the book now and try their hand at this fantastic project...Great way to bring the Thermodynamics to life! Best wishes to ya!" Using the "Buy Now" link will take you to the CreateSpace eStore page. Createspace is an Amazon company. Your purchase is secure, safe, and confidential. Available Here, at Amazon, and now in the United Kingdom. This book will guide you step-by-step through the process of building three low temperature differential (LTD) Stirling Engines for less than $30 each. Two of them are efficient enough to run from the heat of your hand. And all three of them can be built using common hand tools with material available at your local hardware store and hobby shop. The hot air engine (aka: “Stirling engine”) has been around for a very long time. Interest in the technology has been revived in recent years by those exploring new methods for producing “Green Energy”. An LTD Stirling engine is efficient enough to run from the waste heat that is discharged from other appliances or from the warmth of direct sunlight. The most efficient of these will run from the heat of your hand. 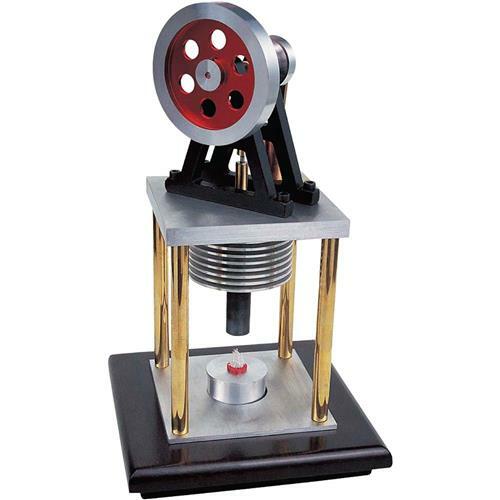 Until now, if you wanted to build your own heat of the hand Stirling Engine you had to either spend several hundred dollars for an expensive kit or you needed access to a precision machine shop. This book breaks both those barriers for you. Now you can build your own working models that will run from the heat of your hand, without the aid of a machine shop. 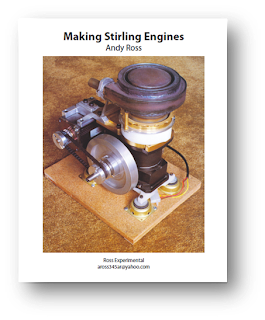 Whether you are a student looking for a winning science fair project, or just a home hobbyist looking for a fun project, you will find this book to be a helpful guide in creating your own LTD Stirling engines. You will find detailed instructions, tips on finding parts, and over 130 illustrations to help you recreate Jim Larsen’s original designs for these highly efficient small models. This manual is intended to serve as an introduction to Stirling cycle heat engines, as a key to the available literature on Stirling engines and to identify nonproprietary Stirling engine design methodologies. Two different fully described Stirling engines are discussed. Engine design methods are categorized as first order, second order, and third order with increased order number indicating increased complexity. FORTRAN programs are listed for both an isothermal second order design program and an adiabatic second order design program. Third order methods are explained and enumerated. In this second edition of the manual the references are updated. A revised personal and corporate author index is given and an expanded directory lists over 80 individuals and companies active in Stirling engines. Copyright: Unclassified; No Copyright; Unlimited; Publicly Available. Click the link below the image to begin your free download. Imagine a small engine for your bicycle, canoe, or campside generator that is as quiet as a sewing machine. Its exhaust flue gases are nonpoisonous, nonpolluting and practically odorless. It starts easily, and should run without repair for many hundreds of hours, burning less than one-half liter of kerosene per hour. What began as a hobby project quickly grew into an obsession, and Andy Ross has devoted a significant portion of his time to working on stirling engines ever since. This book chronicles that work, with the aim of encouraging and assisting others interested in making small Stirlings. 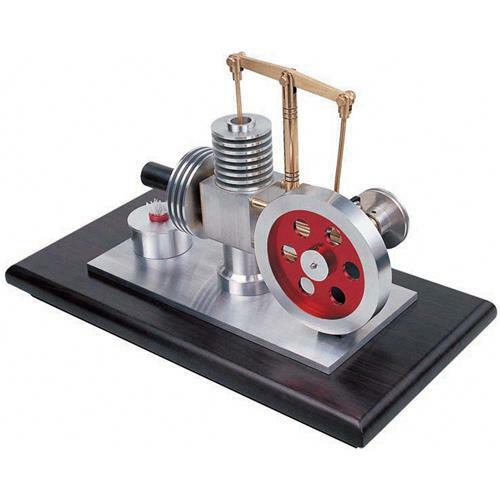 Andy Ross is one of the most revered and respected Stirling engine designers of our time. He often shares his designs with others for no fee. He has granted permission to StirlingBuilder.com to offer his book for free download. You have his permission to download and enjoy this book. NOTE: This copy of Making Stirling Engines is of the 3rd edition, which was printed June 1st, 1997. It has not been updated, and various addresses and others information may be outdated. It is being made available here for the downloader’s personal use only, not for resale, commercial use, or any other use in violation of its copyright. Downloading this book will be considered as agreeing to these limitations. Grizzly.com offers two nice kits including plans and materials for making your own Stirling Engines. Building these engines requires a lathe. Grizzly currently offers the plans and instructions as a free download, and they sell all the metal stock as a kit for a very reasonable price. Would you like to stay current on what it takes to make great model Stirling engines? Subscribe to my blog. Welcome to Stirlingbuilder.com. This site is here to provide plans and guidance for those who want to build their own Stirling engines. We offer a small collection of free illustrated plans for some unique Stirling engine designs, including the new Paint Can Stirling Engine. 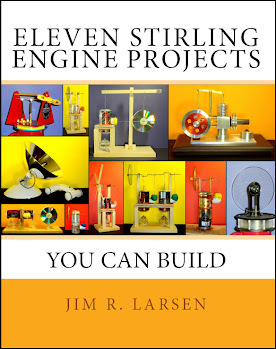 And for those seeking the ultimate prize in home built Stirling engines, we offer Jim Larsen’s book for those who want to build a “heat of the hand” Stirling engine without a machine shop. If you are building one of the Stirling engine designs found here at StirlingBuilder.com, send in your pictures or video and share your progress with us. You will find the email address on the Contact Page.